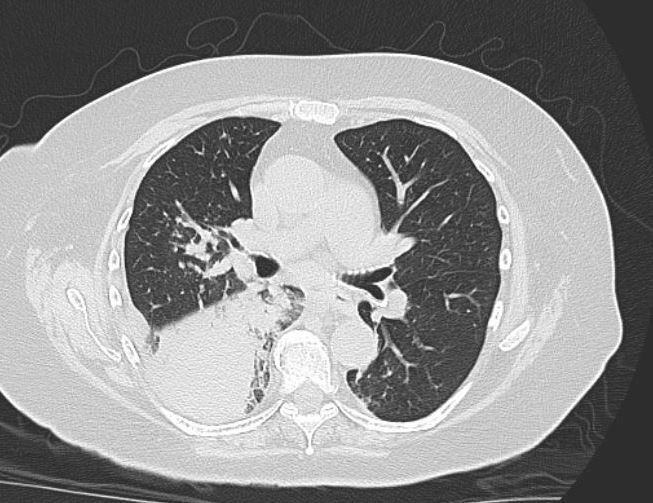 History: A 78yo woman was admitted for ARDS in the setting of right sided pneumonia. About 3 weeks ago she developed fevers, chills, and a nonproductive cough. Chest X-ray at an urgent care showed a right lower lobe infiltrate, and she was started on PO Levofloxacin but worsened over the next 3 days. She was then admitted to an outside hospital and started on IV Ceftriaxone and Azithromycin, but continued to worsen over the next week with increasing oxygen requirements and was intubated prior to transfer to our hospital, where she was started on Vancomycin, Piperacillin-Tazobactam, and Azithromycin. Per family, she had no chest pain, abdominal pain, joint symptoms, or skin rashes; no other sick contacts. SH: Patient lives in Marquette, Michigan (Upper Peninsula) in a suburban area. No outdoor recreation activities. No travel to other parts of the US or outside of the US. No pets. SKIN: well-perfused, warm, dry, no rashes, no raised, verrucous lesions seen. There is a dense right lower lobe infiltrate, without caivitation, no associated pleural effusion. Remainder of the lungs reveal mild emphysematous changes. The patient was started on AmBisome the night of transfer as the calcofluor stain from her BAL is read as possible blastomycosis (Figure 1). She continued to have increasing FiO2 requirements, and IV Methylprednisolone 1mg/kg/day in divided doses was started on hospital day 5. 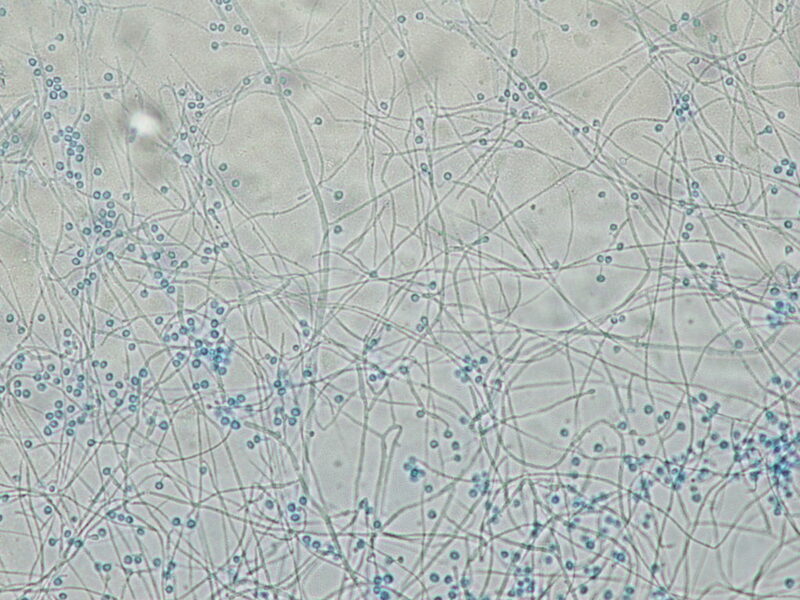 Labs in Hospital:urine Blastomyces Ag 5.7, Urine Histoplasma Ag 9.75 (likely cross-reactive), BD glucan negative. 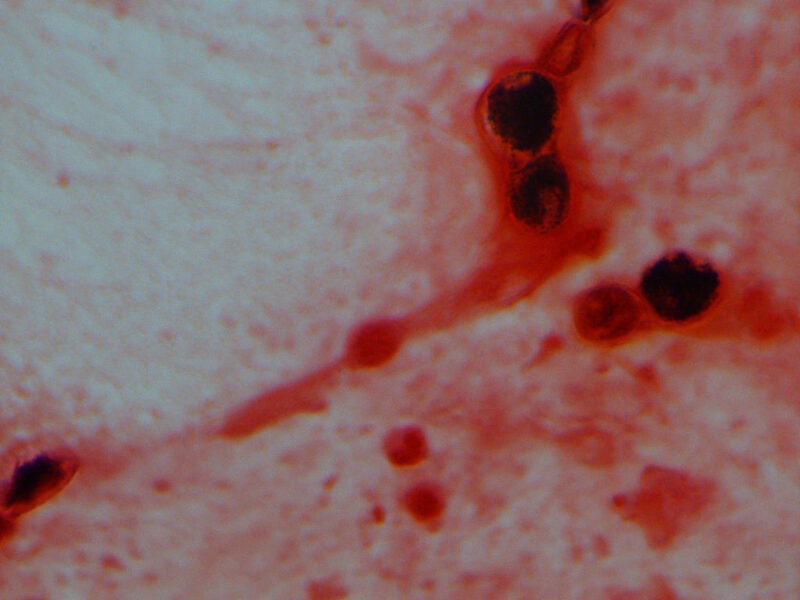 A call placed to the microbiology department at the outside hospital led to a review of their sputum gram stain (Figure 2) – the technologist states that that there are multiple, poorly staining organisms larger than a WBC which are likely Blastomyces. Outcome:About 2 weeks into her course, the patient remained on the ventilator and had worsening of her pulmonary infiltrates on CT of the chest consistent with ARDS. Following family wishes, she was transitioned to comfort care. In North America, blastomycosis, caused by Blastomyces dermatitidis, is usually seen in the Mississippi and Ohio river valleys, though occasional cases have been reported from other states. In endemic areas, the environmental reservoir forB. dermatitidisis assumed to be found in decaying vegetation and in soil, especially near rivers and lakes. In addition to humans, B. dermatitidis also frequently causes disease in dogs (1). Pulmonary infection is the most common form of blastomycosis, though it can have a range of manifestations from asymptomatic/subclinical infection to severe disease complicated by ARDS. Symptomatic patients usually report cough (productive and nonproductive), fever, malaise, pleuritic chest pain, not unlike the presentation of typical bacterial and viral pneumonia. 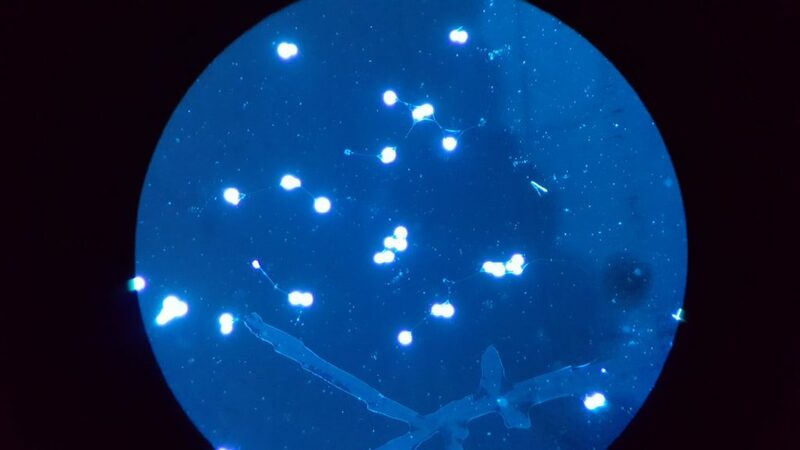 Patients who develop ARDS are often not immunocompromised, but presumably either inhaled a large inoculum of conidia or manifested a vigorous host response that led to ARDS. Mortality remains in high in patients with fulminant pulmonary disease/ARDS (2). Diagnostic testing, such as in this patient’s case, is often delayed due to a low index of suspicion, especially if the patient only manifests pulmonary symptoms. 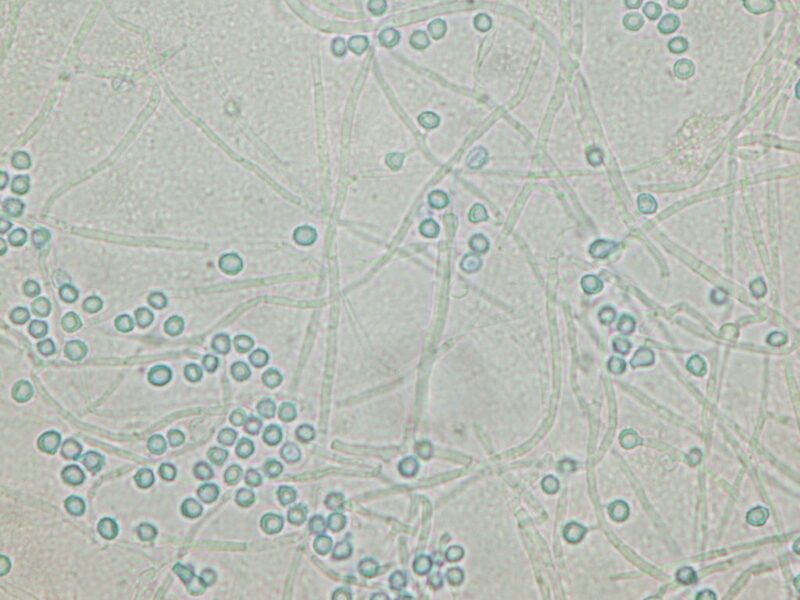 Direct visualization of the distinctive yeast form with broad-based budding on a wet prep of respiratory secretions using KOH, or in this case, calcofluour white staining, should to a presumptive diagnosis and initiation of antifungal therapy. Urinary antigen for Blastomyces is also helpful especially in severe or disseminated disease, but it has a very high rate of cross-reactivity with histoplasmosis (3). Treatment for severe pulmonary blastomycosis is with intravenous lipid amphotericin B at 3-5mg/kg/day, which should be given until improvement is noted – this may take a few weeks. At that time, the patient can be stepped down to an azole, usually itraconazole, which is continued for at least 12 months. Intravenous methylprednisolone has been used in patients with ARDS secondary to pulmonary blastomycosis as a way to decrease inflammation and improve oxygen exchange, but it has not been proven to be beneficial (4). In some cases, extra-corporeal membrane oxygenation has been used to support patients with severe ARDS (5). Castillo CG, Kauffman CA, Miceli MH. Blastomycosis. Infect Dis Clin N Am 30 (2016) 247-264. Bariola JR, Hage CA, Durkin M, et al. Detection of Blastomyces dermatitidis antigen in patients with newly diagnosed blastomycosis. Diagn Microbiol Infect Dis2011;69:187-91. Plamondon M, Lamontagne F, Allard C, et al. Corticosteroids as adjunctive therapy in severe blastomycosis-induced acute respiratory distress syndrome in an immunosuppressed patient. Clin Infect Dis 2010;51:e1–3. Resch M, Kurz K, Schneider-Brachert W, et al. Extracorporeal membrane oxygenation (ECMO) for severe acute respiratory distress syndrome (ARDS) in fulminant blastomycosis in Germany. BMJ Case Rep 2009;2009.